OLCD is a low cost, scalable flexible display technology that is compatible with existing manufacturing lines. FlexEnable is committed to building supply chain options for flexible organic LCD (OLCD) to meet rising demand for flexible displays for a range of applications across consumer electronics, automotive, digital signage and beyond. Our FabEnable service allows partners to build a flexible electronics capability, often leveraging existing assets. In July 2017 Truly Semiconductors became the first display manufacturer to adopt FlexEnable’s flexible OLCD technology which will be implemented into Truly’s existing production lines in Shanwei, China. OLCD volume production is expected in 2019. Companies interested in using OLCD in their products can take advantage of our ProductEnable service designed for strategic projects. We work closely with ProductEnable partners to create exciting product designs and use cases as well as supporting them with a route to volume manufacturing. We can provide small quantities of 4.7” and 12.1” OLCD modules, manufactured on our 14” prototyping line in Cambridge (UK), for early prototyping, concepts and demonstrators. FlexEnable offers a complete process toolkit for manufacturing OLCD modules including array, cell and module assembly. Manufacturing at scale is at the heart of our approach to making flexible displays. Below we have listed some of the manufacturing advantages of OLCD that differentiate it from other flexible display technologies. OLCD can be manufactured in existing a-Si LCD factories taking advantage of already established supply chain. No special equipment is needed to de-mount the plastic from the glass (unlike other flexible display technologies). 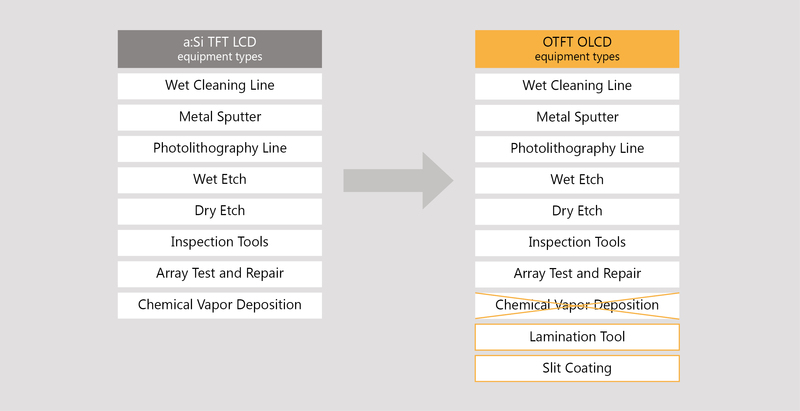 OLCD gives high manufacturing yields comparable to glass LCDs. OLCD can be scaled to very large display sizes and manufactured on large Gen size lines. Tool set typically used in a LCD manufacturing line (left). A fully balanced line conversion will usually require some additional lamination and coating tools (right).